Tomatoes, peppers, beans, lettuce, and other veggies are coming to an end in my gardens. For me, this means an end to fresh, summertime salads and unique creations. (Sad face!) But it’s also the wonderful beginning to warm soups on cool fall evenings. Whether I’m serving a small family meal or a large gathering, soup is easy to make and just plain cozy to eat. 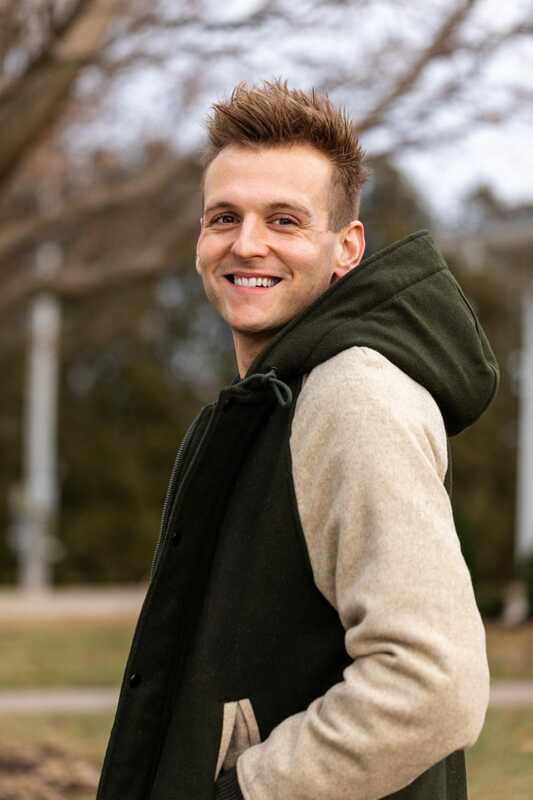 There are so many recipes and the best ones use what you may have on hand – or at least what is easy to procure locally! 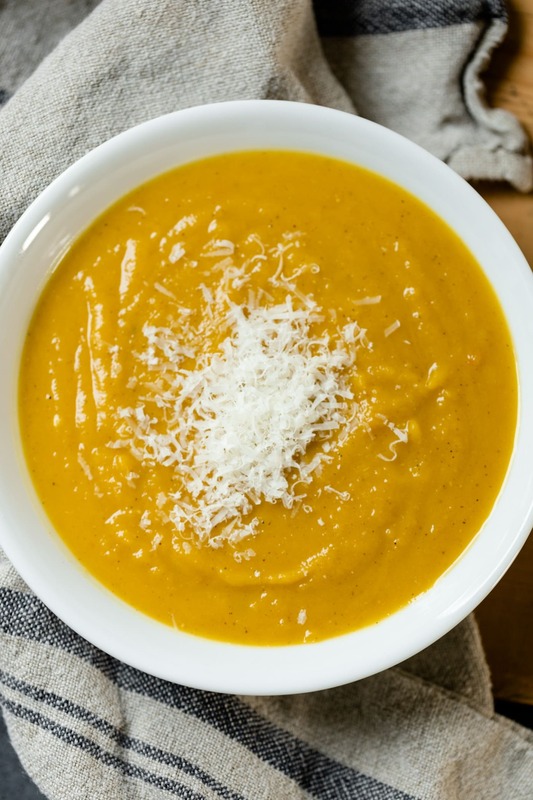 Currently, my obsession is a creamy, curried butternut squash soup. This soup can function as either the first course or the main event of a hearty fall meal. I love to serve this soup in large bowls and garnished with fresh Parmesan cheese. A few crackers on the side would be great too since they’re perfect for dipping. You could also garnish with a sprig of mint because, well… mint and curry are perfect complements! If you’re inviting guests over and the soup is the main event, a delicious cheese plate served with a selection of herb-flavored nuts would also be a great addition! Just look at that creamy texture and bit of Parmesan cheese – YUM! This is the perfect comfort food on a cool fall day, but fairly healthy compared to other comfort foods. And if you opted to add milk instead of half and half, you’re even healthier! 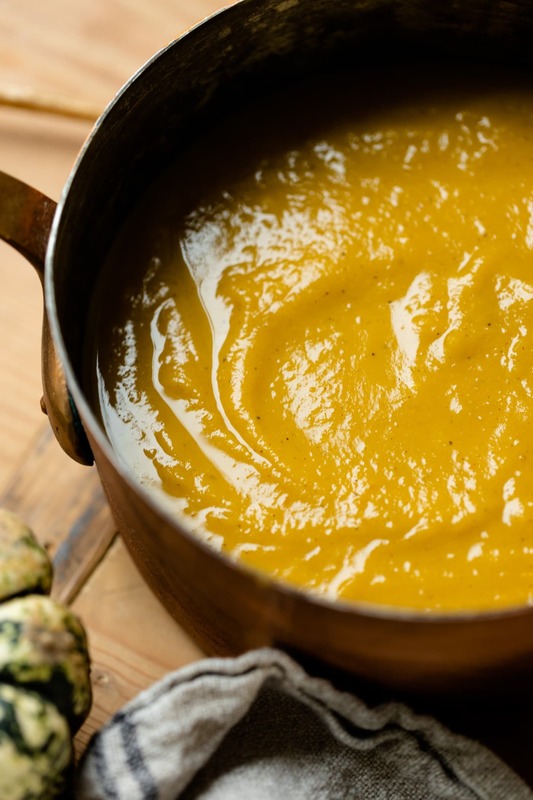 Either way you choose to enjoy this curried butternut squash soup, you’re going to love it! This truly is one of those soups that I go back to over and over again because it perfectly captures the flavors I crave! 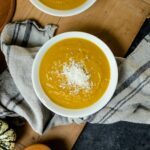 Let me know if the comments below what your favorite fall-time soup is and whether you plan to make this version! 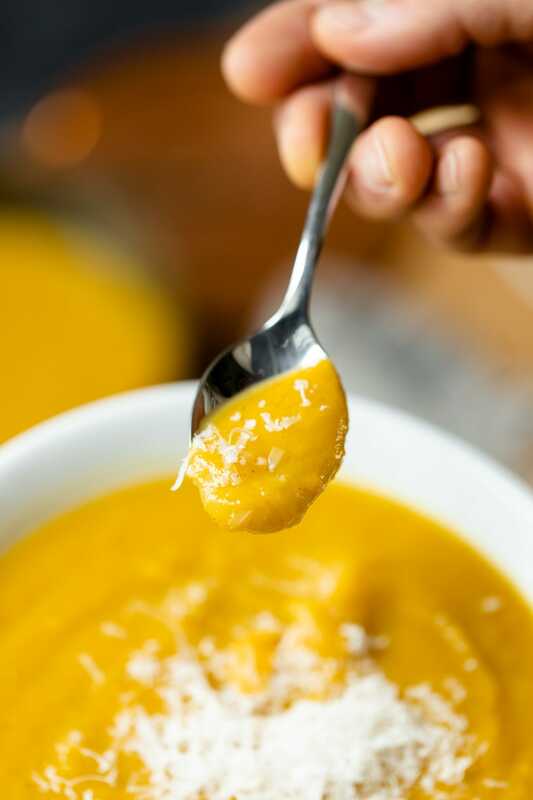 With notes of curry and a delicious texture created by some half and half, this curried butternut squash soup is perfect when the weather outside turns cool! Serve this with crackers, bread or whatever you choose and you’re sure to be in soup heaven! Start with a standard butternut squash. Wash the outside and cut in half, lengthwise. Discard the seeds and pulp and lay face-down on a lightly buttered baking dish. Place squash in the oven. The squash should take approximately one hour at 350 degrees to bake. When done, your fork should easily pierce the squash, similar to a potato. Combine butter, onion and garlic in a pot. Add stock and curry powder to the mixture and simmer until squash has finished cooking. Optional: for more spiciness, add two tablespoons of curry powder instead of one. When the squash has cooked for 40 minutes, take out of the oven and scrape with a spoon into the pot with the onion and stock. Let simmer for 15-20 minutes, stirring occasionally. After simmering, add half and half. Milk can be used as a healthier substitute, but the lower fat content in milk will give the soup a watery texture. Blend the soup to a bisque consistency (a smooth texture). A large food processor was used, but a blender would work as well.